Rich and poor alike, every one of us misses his or her childhood at one or the other point in time. Underwater World of Singapore provides you the perfect opportunity to reenter the fairy-tale world of a childhood, rekindle and share those memories with your kids, while experiencing the amazing oceanic life; be you a tourist or local. Underwater World is an intimate, family-friendly oceanarium, located on the offshore Santosa Island of Singapore. It is a whole new place once you enter. A home to over 2,500 marine animals of 250 species from different regions of the world offers a lifetime experience of its own kind. Opened in 1991 as the world’s only underwater interactive world, Underwater World was re-opened in 2010 with some of the parts completely revamped to complement the contemporary look of the marine life. This sanctuary for water creatures is so well taken-cared of that you wouldn’t blame yourself for wanting to stay longer rather than going back out to the wild. Begin the journey by travelling back in time to discover Asia’s maritime heritage on a 83-meter long travelator that moves you along a submerged acrylic-windowed tunnel to the colorful Reef, where you find an array of marine life including coral reefs, stingrays, moray eels, turtles, sharks and others in the Ocean Colonies. Idiosyncratically known for Indo-Pacific Humpback Dolphins; also known as Pink Dolphins, Underwater World showcases mesmerizing performances by pink dolphins and the adorable fur seals, allows you an opportunity to play and interact with the dolphins and take photos with them under the lagoon. Have you ever thought of taking ride of a swimming pool with the dolphins? Nope? What fun did you have in life then? 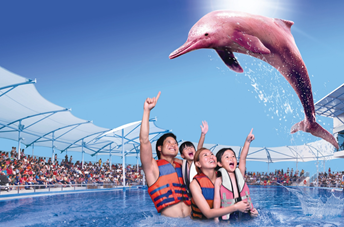 Anyways, Underwater World gives you that unthinkable opportunity to swim with the pink dolphins in the Dolphin Lagoon. Dolphin Lagoon, which is a pool just adjacent to the main structure, where get to see the dolphins play and perform various tricks. If you dare, you can be chosen to enter the lagoon and swim with the dolphins during the show, and take snaps with them too. A common aquarium becomes special with a simple idea. Instead of making you walk around and over the aquarium, a moving belt carries you below it, giving you the sensation of living inside the aquarium, watching the sharks and the other big fishes passing over your head. The pathway tunnel gave us an organic view of how a variety of water creatures co-exist underwater. 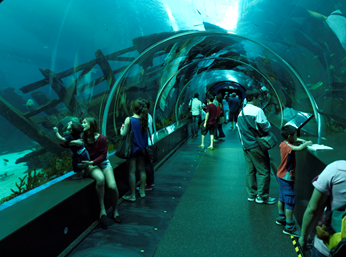 The tunnel gives you kaleidoscopic views as sharks and other fishes swim over your head. We all know how Sharks play an important role in maintaining the ecosystem of the ocean. At Underwater World, you will get a chance to feed the deadly sharks, which normally eat sick, weak and dead fish and help maintain biodiversity and the health of the ocean ecosystem. 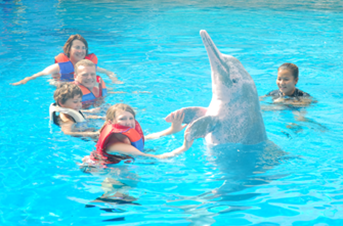 Have you ever imagined being able to touch the fish and other marine animals such as sea lions and sea horse? Touch of Pool at Underwater World enables you to experience the touch of a fish and other creatures first hand. This is the latest avant-garde attraction. The Mystical Anti Gravity Interactive Concept Tank enables you to feed fishes enclosed in the MAGIC-T through openings in the side and not have any water splashing out of the tank. There are many other attractions, such as Ray of Fun, Jewels of Reef, Turtle Pool and many more. Other interesting exhibits are the starfish, porcupine fish, so-called because they take in water to appear bigger when threatened, and the archerfish, which catch insects by shooting jets of water above the surface. There is an awesome show about a bird who flies back in time, called The Wings of Time. It is a sound and light show. All in all, underwater World; although may give you a taste of ‘90s theme, is an unforgettable experience for anyone who enters this amazing world of ocean. The experience is so surreal that you wish you could be part of that experience even for just a few minutes. The peaceful impact of marine life is so strong that you might lose yourself in their world for a time being. Its fluorescence is so beautiful that you may feel mesmerized by the effect. Underwater World may not last a day long but for family outing this is the perfect location in Singapore. Even for tourists, Underwater World remains on the top of the priority list. Those have kids, Underwater World is a must-experience attraction in Singapore. Do not miss this first hand experience of the fascinating marine life.